Stunningly creative concepts, executed flawlessly - introducing the Paper Hat sessions. A Puptrait is more than a puppy portrait. No where does this sentiment ring truer than when shooting our Paper Hat sessions. 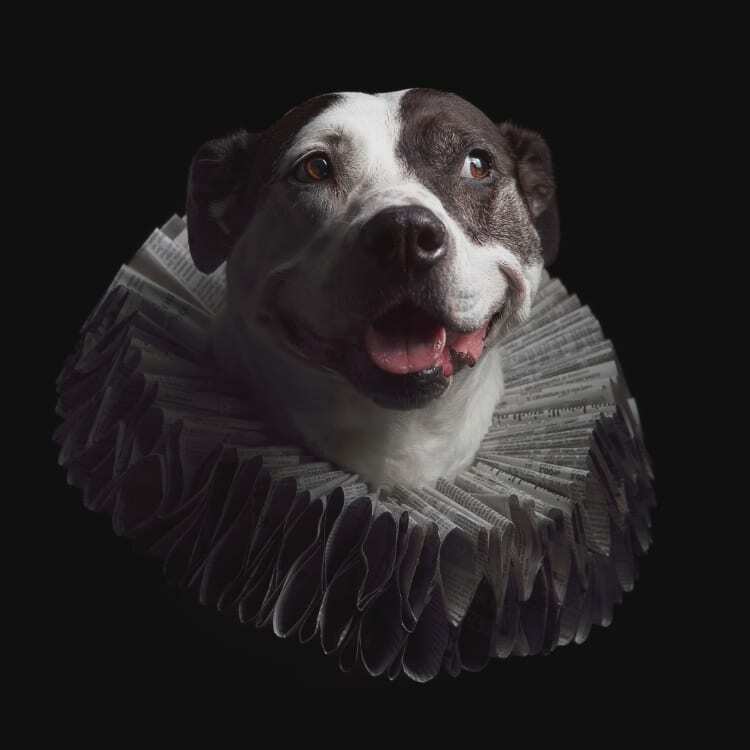 Uniquely inspired and absurdly difficult to capture, these signature creations elevate dog photography into an art form. Every paper hat is in itself a unique piece of art. In fact, no two hats are ever the same. 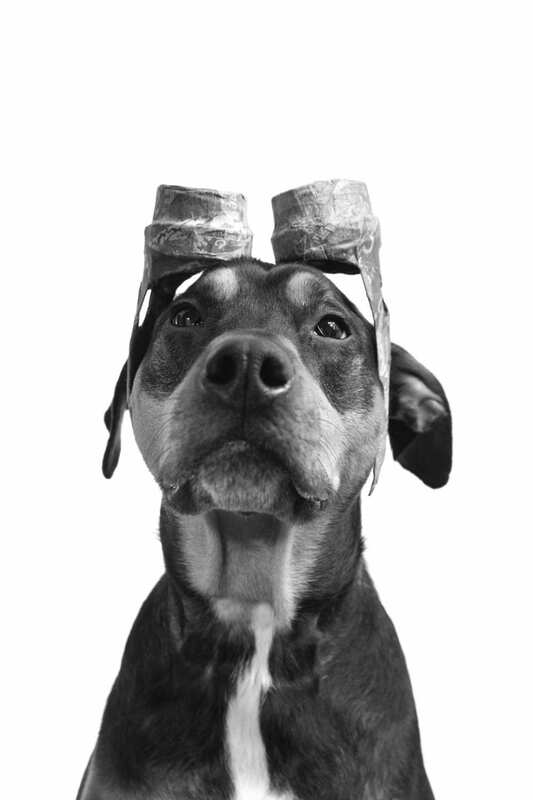 Each piece handmade by our studio founder and pet photographer J.B. Shepard from upcycled post consumer paper products – including old newspapers, beer boxes, paper plates and junk mail. The unique coloration and design patterns decorating the hats is composed entirely from careful placement of different color slips of paper. Meaning, once assembled these hats are not dyed or painted, resulting in a vibrant texture and spontaneous patterning that is truly like nothing else. This time intensive process requires 3 to 5 days on average (depending on complexity and size) for assembly and drying before the pieces are ready to be worn and photographed. Being made from paper, these delicate pet costumed can only be used a handful of times - often only once - before being retired forever. 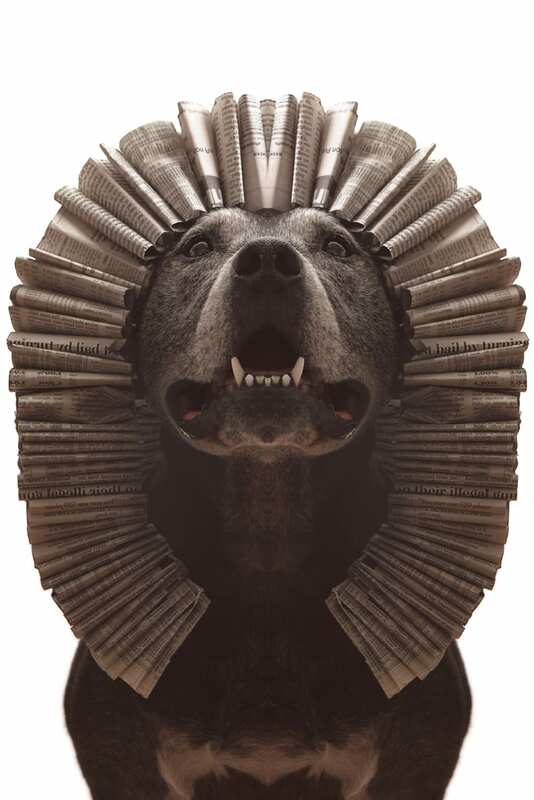 Ensuring that every Paper Hat session is a unique pet portrait experience - truly like no other. 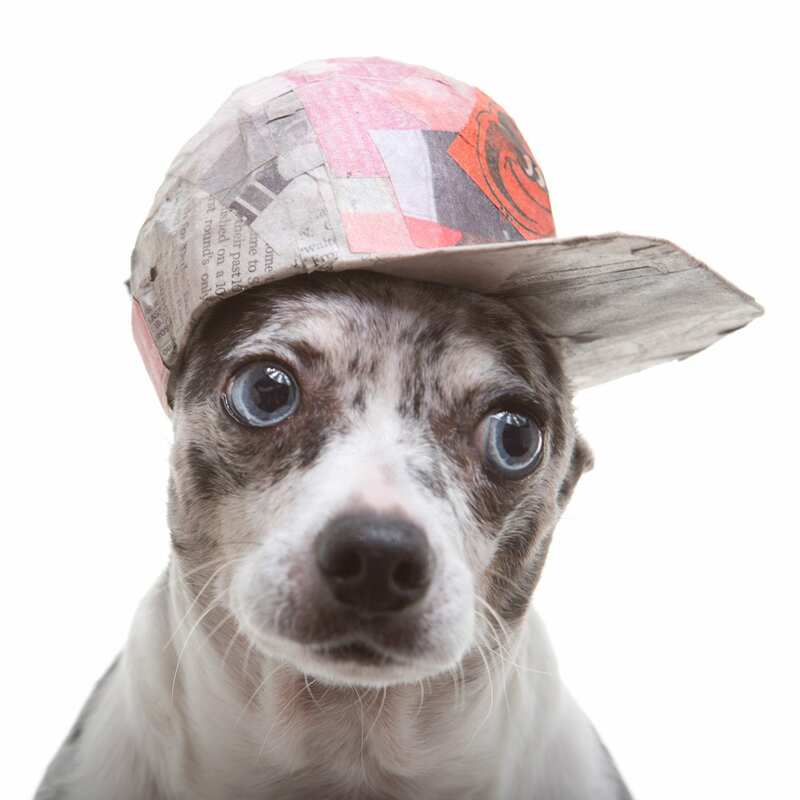 Puptrait Studio paper hats are purposely not secured or strapped down in any way. 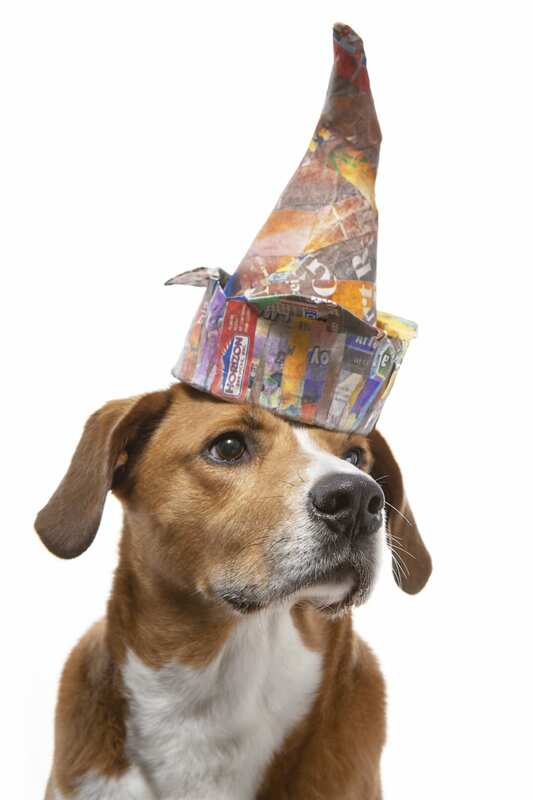 Our paper hats are not intended to worn by dogs for an extended period of time and in most instances, they’re not appropriate for video work. They are designed exclusively for still photography captured in a studio environment and are intended to be worn for only seconds at a time. And, there is a good reason for this. 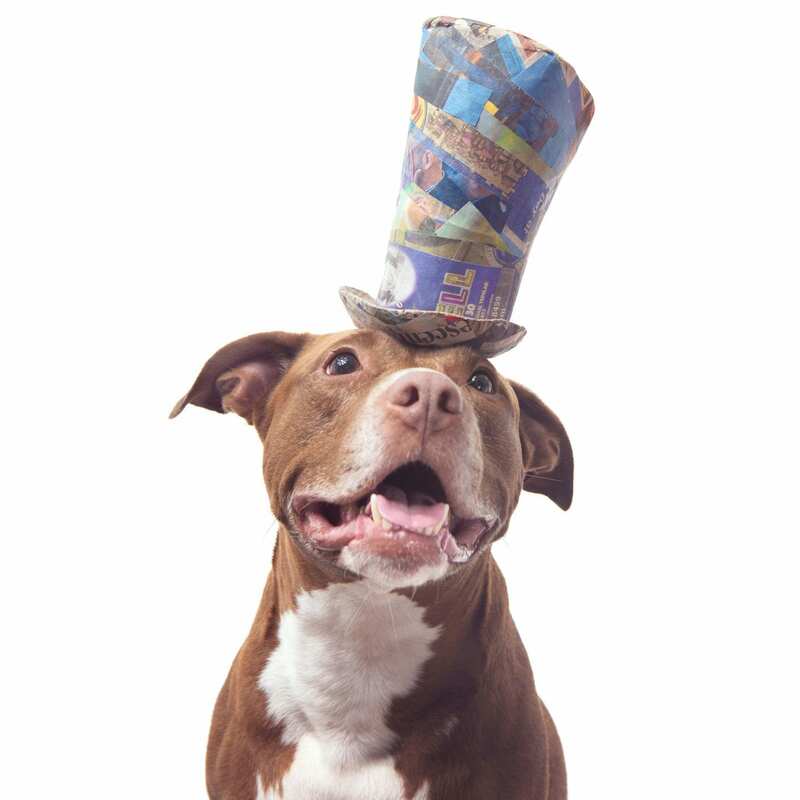 We realized while experimenting during our first paper hats series that if a hat is secured on a dog, that was exactly what would be captured on camera – a hat strapped to a dog. But by applying a more consent based approach to animal handling, we realized we were able to spark expressions that were almost human in nature. When it comes to portrait photography, the most normal and natural expressions are often only made possible through distinctly unusual means. This is especially true when working with dogs. The thing about dogs is that they are naturally inclined to engage with humans, often passively or in a reactionary way. If you look at other styles of dog portraits, you realize that most of the time a dog is engaged with the camera they are only giving one of two expressions - "What is my next command?" or "Is that treat for me?". But by leaving the hat unsecured, we allow the dog agency. Freeing the subject momentarily to disengage from the handler's command, allowing them to instead directly engage and interact with the hat. While these moments are fleeting, they are significant in that they provide a glimpse into the dog's true personality. Our private pet portrait clients are free to choose from our ready selection of paper hats, crowns, and collars – and may use these pre-made costume pieces in their Puptrait Studio session at no additional charge. Our ready made collection of paper hats are available exclusively for use in studio and contain a variety of unique designs, patterns and sizes that are regularly updated as new hats are created or retired. Clients looking for a specific look or specialized design for their dog portrait session are encouraged to commission a custom designed piece. To order a custom designed paper hat please call our studio (443.604.0711) prior to or shortly after booking your session to discuss your project and any additional costs. Our studio charges $75 an hour for design, material harvesting, and assembly of custom made paper hats. However, like our sitting fees, these additional design charges and fees may be credited to your first print order if certain criteria are met, the details of which will be discussed when you call the studio to place your custom order. Please note that we require a minimum of one week from booking to scheduled session date for custom paper hat commissions. More sophisticated designs or custom projects that require specific or unique materials to be completed may require additional notice to be accommodated. View availability and book online using the scheduling widget located below. Visit us at our dog friendly studio location in Baltimore or schedule an in home or on location photoshoot for your dog anywhere in Maryland, Washington D.C., and Northern Virginia. Minimum print commitments and sitting fees vary by location, but are automatically calculated through our online booking calendar.